Ahead of the F100 race meeting the following week, conversation in the office had turned to historical karts and a member of the team mentioned the “Yellow Peril”, all I knew about this kart was that it was very old and lived in the workshop, stationary and untouched, gathering dust. 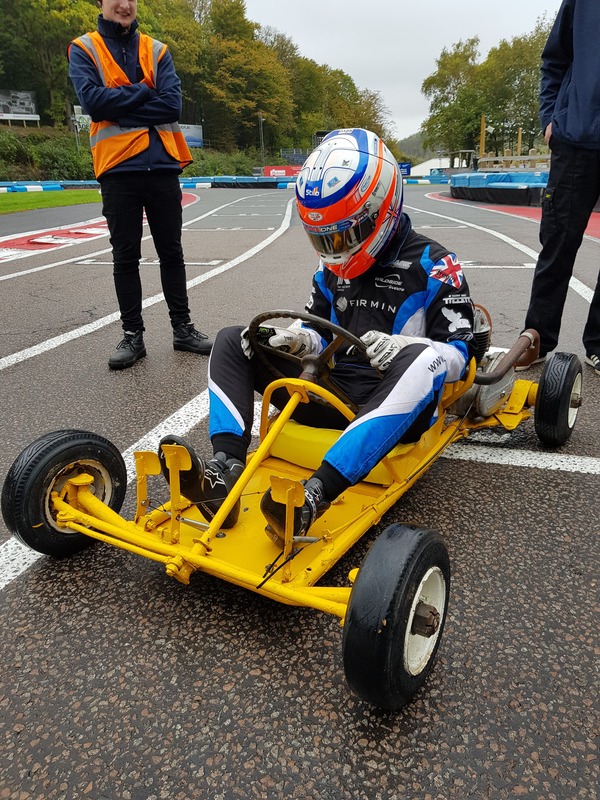 It turns out that The “Yellow Peril” was actually one of the first prototype karts to be built in the UK, in circa 1959. In a moment of pure madness, I said I would be happy to try to drive it. No offence to 1950’s kart manufacturers intended, but at the time I assumed that as it had been gathering dust for quite a while, it probably wouldn’t run, so there was actually little risk of getting behind the wheel. 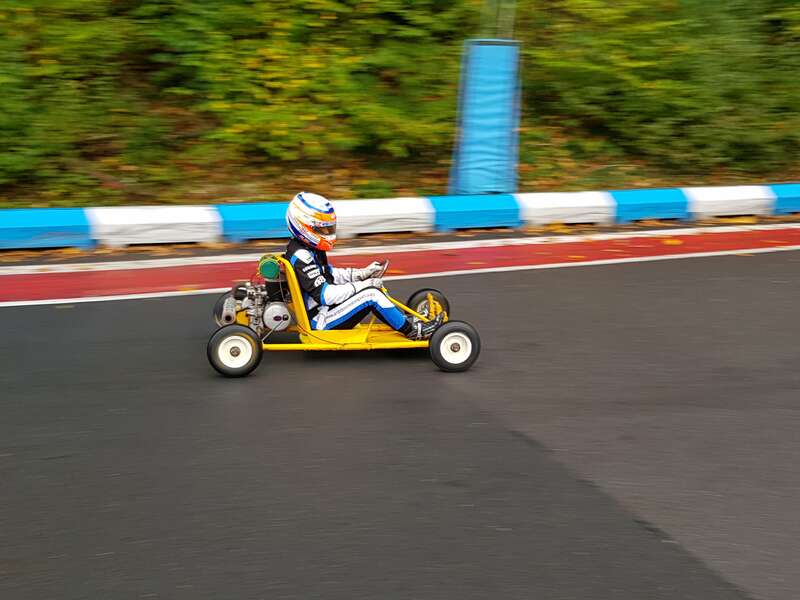 With that in mind, I mostly forgot about it all, until news arrived that the kart was all-well and running fine and that we had booked out track time the following week so I could test it. Now, I would be lying if I said I hadn’t been praying to the weather gods for it to be dry, but clearly, no one was listening because it was a damp day and the circuit was very greasy. Roughly an hour before I was scheduled to go out on track I took a stroll up to the workshop to see the kart being prepared. As I turned the corner I could see the front tyres (best described as shopping trolley wheels) poking out of the workshop doors. Upon the first glimpse, you can see a seat which looks like it had been chopped out of a sofa and stuck onto the kart with a huge steering wheel hanging down just above it. I have to say it looks terrifying, it’s proper old school engineering not to mention it had three pedals, which I found extremely unusual in a kart. However, I went and grabbed my kit and geared myself up for what was to come. Word had got out that the “Yellow Peril” was due to make an appearance and a small crowd of staff had gathered to see the kart in action again. I can best describe entering the kart as trying to wedge myself between a rock and a hard place. Immediately I had comfort issues, I am not very tall at all but my knees were up around my ears. Before I knew it members of the team had started pushing me down the start/finish straight to bump start the kart, it eventually kicked into life and I made it to turn 1 before the kart spluttered to a halt. Again the kart was push started and of I went, however, the choke was left on and being of the smaller stature I couldn't reach round to the back of the kart to turn it off, so I spent a lap producing lots of smoke but not really going anywhere. On the third time lucky, of I went and this time the kart ran perfectly. I completed three laps, gradually increasing my speed each time and I have to say I was very impressed with the throttle response and overall driveability of the kart. It was relatively easy to control and it loved going sideways. I didn’t mind that it wasn’t “fast” as the lack of brakes was new to me (and terrifying), you had to hit the pedal hard down before you could feel even the slightest bit of brake pressure. It was very strange using three pedals, on a few occasions instead of pressing the brakes I was actually clutch kicking which contributed to the sideways action. I would have happily stayed out for longer but the steering wheel was cutting the circulation to my legs so I figured it was best to pit in. I have to say the “Yellow Peril” was great fun to drive, very responsive and a real insight into old school engineering. I would jump at the opportunity to drive it again (once I get the feeling back in my legs).